This Refuge Tree thangka depicts the assembly of gurus and deities that belong to the Dudjom Tersar tradition, a Nyingma terma or 'hidden treasure' transmission that was widely taught by the late Dudjom Rinpoche (1904-87). The vast Refuge Tree arises from Lake Danakosha, where Guru Rinpoche (Padmasambhava) was born, the great eighth century Indian tantric master who introduced Vajrayana Buddhism into Tibet. Padmasambhava is seated upon a moon disc, lotus, and lion-throne at the centre of this tree, with an arc of lotuses and rainbow light encircling his aura. Behind him are the stacked and silk covered texts of the Buddhadharma, which are likewise surrounded by rainbow light. At the top centre are Samantabhadra and his consort, with Vajrasattva and Garab Dorje below, who collectively represent the three 'divine bodies' or kayas of an enlightened Buddha. Descending beneath this trinity are seven lineage gurus, with Dudjom Rinpoche appearing above Padmasambhava's head. Upon cloud-thrones in the upper corners are eight gods that present various offerings. 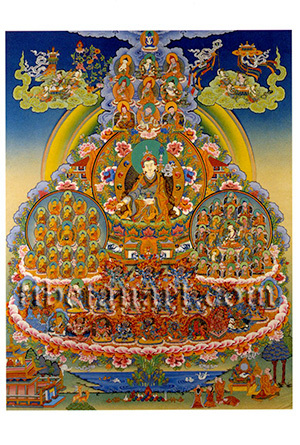 Seated within a rainbow circle to Padmasambhava's right is an assembly of twenty-four Buddhas, with Shakyamuni at their centre, who collectively represent the thousand and two Buddhas of our era. And seated to Padmasambhava's left are the assembly of the eight Bodhisattvas and the sixteen Arhats, who similarly appear within a rainbow circle. Below Padmasambhava are the eight wrathful Heruka deities of the orally transmitted Mahayoga Tantra traditions, and the two-armed form of white Vidyadhara Heruka in yab-yum with his consort. And across the lower lotus base of the tree are thirteen of the main protective deities of the Nyingma tradition. In the lower foreground are various auspicious offerings, deer, fishes and birds, practitioners making prostrations, and a monk presenting a mandala offering.